For Christmas, I got my "Ukrainian" a Wii Fit Plus. I figured he could use something to keep him occupied when I am not around (we live 30+ miles apart, so un-ubiquitous me can't be there ALL the time). And although it was a gift "to him," I have been getting my use out of it, as well. I had, in the past, played other active video games, especially DDR, but I found that to be incompatible with running due to tightening leg muscles. Of course, this was after telling me that I weighed more than I did in the morning... Yes, that's a green cover on the mat. The default color is white, but I bought that cover knowing it could come in handy. So this thing weighs you and tells you your Body Mass Index (BMI). It asks you for a weight goal and timeline, if you have one. It also calculates your "Wii Fit Age" by taking you through tests that involve center-of-balance and sometimes mental calculations. The lowest Wii Fit age I've received to this posting is 20. Yay! The Wii Fit Plus game has a variety of exercises, ranging from Yoga to Strength to Aerobics. Here's a screenshot I took after doing some of the yoga. So my balance isn't great, and by playing the mini-games also included, I have learned that it will take some time to improve it. It certainly doesn't help that I often play after I've had a workout and am already too tired to hold a good posture. The system logs your progress, activities, and scores. You are supposed to play every day, but I am doing far from that. But even if I did, I am not sure this will help with my running at all, besides the possible controlled breathing they show you in yoga. 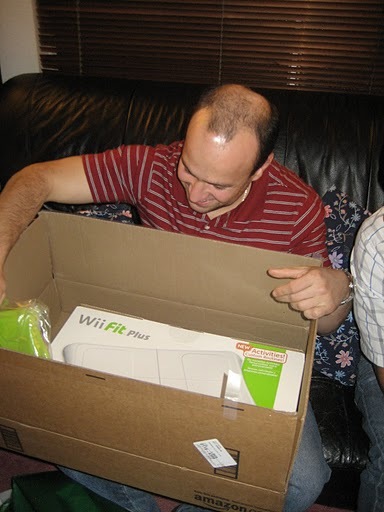 My sister turns 25 tomorrow and we got her a Wii as a birthday/housewarming present (she just moved into her first apartment). It didn't come with the Fit part, but I'm hoping that having the Wii will convince her to spring for that part. Seems like such an easy way to get/stay in reasonable shape, without any gym-related anxieties for those of us who don't spend hours at a time logging miles on treadmills. Good luck with the rest of the research! I got a Wii about 2 years ago and I used it for maybe 2 months and quit. I sold it. Just wasn't for me. I've played with our friends' Wii (wait, that sounds dirty, LOL) and it was fun, but not something I'd be interested in on a regular basis. we definitely had some wii fit fun with the family over christmas! i love the wii fit plus! i'm guilty of playing the balance games and not really doing any serious "training" on it. we love taking it home for family gatherings and battling it out on the ski jump and obstacle course. Random Photo Entry 25: Happy "Birthday," Cat!